Great Lakes Brewery (GLB) is once again pleased to announce that we’ll be “fighting to end hunger in our communities” with the annual Hops for Hunger Food Drive in support of Daily Bread Food Bank. This December, any customer who purchases a can of ‘Grandpa’s Ol’ White Eggnog Stout’, a beer brewed and labeled specifically for Daily Bread (see label below), will help contribute as $1 from each can sold will be donated to our neighbours at Daily Bread. 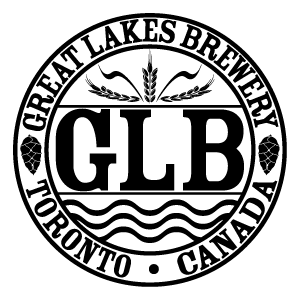 Cans are available to purchase at the GLB retail store at 30 Queen Elizabeth Blvd, Etobicoke beginning tomorrow, December 4th. The beer will also be available on draught in the brewery taproom and $1 from each pour will also be donated. 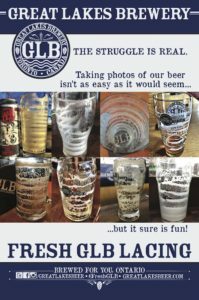 GLB will also be encouraging customers coming into the brewery retail store to donate any non-perishable food items, along with baby food and diapers. Customers can drop items in the yellow Daily Bread collection bin located within the store and GLB will provide a complimentary 5oz sample. Daily Bread Food Bank’s Holiday Drive is aiming to raise $4 million in donations – the most ambitious goal they’ve ever had. 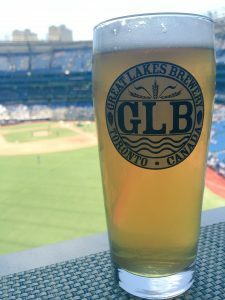 Last year, thanks to the support of the local Ontario and Etobicoke beer communities, GLB was able to donate $3600 and many boxes of much needed food to Daily Bread and would like to build on that in 2018. Further to the Hops for Hunger campaign, GLB staff, in various departments within the brewery, have made CAN Christmas Trees that will be auctioned off during the first ever GLB Christmas Market on Saturday December 8th, with all winning bids (proceeds) being donated to Daily Bread. Daily Bread Food Bank is a registered charity that is fighting hunger in our communities. A distribution hub, Daily Bread provides food and support to almost 200 food programs across Toronto. Daily Bread also works towards long-term solutions to hunger and runs innovative programs to support people on low incomes.